The Brisbane to Gold Coast Cycle Challenge is the biggest and best bike ride in Queensland. This exciting bicycle event, which will happen on Sunday 16 October 2016, aims to get more people to cycle more often and, at the same time, to fight heart disease through raising vital funds for the Heart Foundation. Heart disease is considered as the Australia’s number one killer. This medical condition is a major cause of death and one of the largest health concerns in Australia, killing one Australian every 12 minutes. With healthy diet and lifestyle changes, heart disease can be prevented. Thus, your Gold Coast chiropractor at Hinterland Chiropractic encourages you and your family to take part in this fantastic annual cycling event. 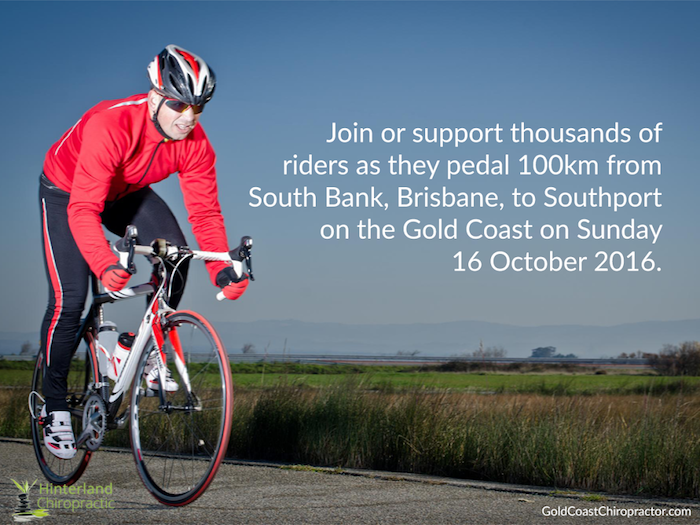 It will be expected that around 6,000 riders or more will join in the 2016 B2GC as they travel 100km from Brisbane’s South Bank to Southport on the Gold Coast. B2GC is one of the many events run by Bicycle Queensland that, aside from helping combat heart disease, also supports infrastructure and safer cycling in Queensland. Riders will enjoy a traffic-free ride on the South East Busway for the first 17km ride to Rochedale. For riders who are not ready for 100km, there is a 60km option from Logan to the Gold Coast. Hinterland Chiropractic enjoys offering support for local sporting events such as Brisbane to Gold Coast Cycle Challenge 2016. Your Gold Coast chiropractors can offer support in whatever is needed – from pre-race health screening to post event massage including sports taping and injury information. Your Gold Coast chiropractor may also provide nutritional advice to supplement your training and recovery. In addition, our chiropractors can assess your musculoskeletal system. We will look at muscle strength and endurance, as well as motor control and balance to recognise any “weak links”. As chiropractors, we can improve these “weak links” so it won’t affect how your joints and muscles work together. Brisbane to Gold Coast Cycle Challenge 2016 is a great way to improve you health and enjoy the beautiful Brisbane spring morning, along with thousands of riders who are ready for tackle the 100km trip. Your Gold Coast chiropractor at Hinterland Chiropractic supports this fantastic event by providing the assistance you need. Don’t miss the opportunity to be part of Queensland’s biggest and best bike ride in 2016. When it comes to healthy and active lifestyle, you can count on us here at Hinterland Chiropractic.